The boys’ soccer team participated in the Mainline Soccer Jamboree at the United Soccer Training Center in Downingtown, Pennsylvania, this past Sunday, September 16. The showcase featured 20 independent schools from the east coast and provided exposure to college countless coaches who came out to watch the athletes in action. The invitation-only event was facilitated by Colgate University. The Knights' day began at 8:30 when they left the GSB campus. 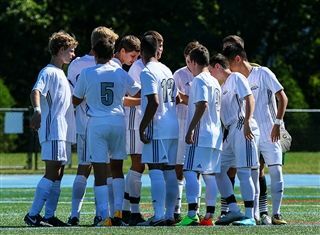 They were set to face Northwood School, an elite soccer school in New York and one of the toughest teams in the entire showcase, later in the afternoon. The Knights put up a good fight against the Huskies, but in the end, they fell 3-0. Goalkeeper Alex Borto ’22 made 12 saves, almost all of them against difficult shots. It was not only a benefit for the players’ college aspirations, but for the rest of their 2018 season as well.